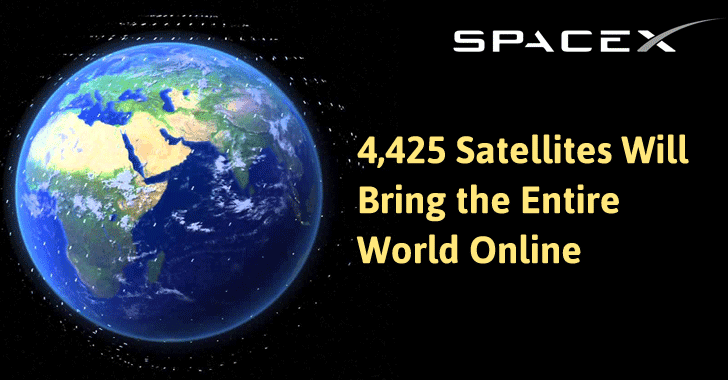 SpaceX is requesting the government for permission to operate network of 4,425 satellites to provide high-speed, global internet coverage. Elon Musk is planning on sending more than 4000 satellites into orbit for a faster and secure internet connection. Documents filed with the US Federal Communications Commission (FCC) on Tuesday propose an initial launch of 800 satellites to create an orbiting digital communications array to cover the US, including Puerto Rico and the US Virgin Islands. Such a system would provide a space-based alternative to cable, fiber-optics and the other terrestrial internet access currently available. SpaceX is not the first to propose such a system. Similar internet-via-satellite networks are under development by privately owned OneWeb and by Boeing, while a $200m satellite leased by Facebook’s Internet.org initiative, which has a similar goal of providing global internet access, was destroyed in an explosion of the SpaceX launch vehicle contracted to send it into orbit. Each satellite SpaceX proposes to put into orbit, without its solar panels extended, is the size of an average car, measuring 4m by 1.8 by 1.2m and weighing 386kg. SpaceX has not set a date for the satellite launches, but said that they would orbit in a range between 714 miles and 823 miles above the Earth. Musk said in January 2015 that the plan would cost at least $10bn. It gained $1bn in funding from Google for the project. Google has been attempting to perform a similar feat, blanketing the globe in internet access, using high-altitude balloons. Facebook’s other internet initiatives have revolved around the use of high-altitude solar-powered drones. SpaceX operates a satellite launching business, with contracts with Nasa for supplying the International Space Station - the first privateer space firm to do so. But its rocket launches have been on hiatus since 1 September following the Falcon 9 booster explosion. The company hopes to resume launch operations next month.